And here it is September. We're three quarters into the year and to me it seems like we should still be in Spring or at least early June. I'm usually quite good at living in the present moment... and I did revel in the beauty of so many juicy joy-filled moments of my summer. Yet, I still feel like the days whipped past in a whirlwind, and I wonder if I actually fell asleep and missed the last month or so -- like old Rip Van Winkle. The ruby red apple in the photo above is sitting on my counter. Nothing says autumn quite like the arrival of fresh, fragrant batches of apples in a grocery store or marketplace. And, then when you bite into the crunchy, crisp skin, there's that sweet juice dribbling down your chin and you feel like a kid again. For who of us of a certain age didn't have an apple rolling around in a little tin lunch kit (mine was patterned in red and black plaid) when we started first or second grade. So, what else did you find in your lunchbox? I remember Grade Four very well for that was the year I wouldn't eat anything but tuna fish sandwiches. All year. Every day. I couldn't get enough. My poor mother was gagging already as she put together one more sandwich and wrapped it in waxed paper and tucked it next to the apple and a couple of cookies. She'd ask every morning, are you sure you want tuna again? Yup, I want a tuna sandwich. It would have been on homemade white bread. Yum! And... did you take some of that wax paper with those little toothy edges and iron brightly coloured leaves between two sheets to hang in your classroom or on the kitchen window? Were you permitted to press the waxy pages together with the hot iron? Or did your mom do it? Did you love the smell of the wax as it melted? I sure did. And... what about that first week of school when you wanted to take something for your new teacher and your mom would wrap a fistful of pointy petaled dahlias to take on the school bus, and you'd shyly, but proudly, present them to her when you got to school. All this talk of school days and I had to go find my old pictures. Here's my Grade Two Class. Staring into the faces of my old familiar classmates, I still remember everyone's names. And such a flood of memories of those wonderful, simpler times in the early 1960's. I can even tell you which boy I really, really liked... he's standing on the end of the last row, on right side. He tried to give me a kiss once on the playground. Everyone else had already gone inside, the bell had rung, and we were trailing behind. I didn't realize what he intended. I was surprised and moved my head. So the kiss met empty air instead of my cheek.You know, I forever regretted not getting that kiss. I wonder if he ever did. There... enough telling tales out of class. And all because we turned the page on the calendar. Here's wishing you a beautiful day and a wonderful September ahead! Well, that was fun to read! Stirs up a pot of memories of my own school days. I'm glad I have many good memories of my childhood and my school years. what lovely reminiscing of your school days, especially that missed kiss! 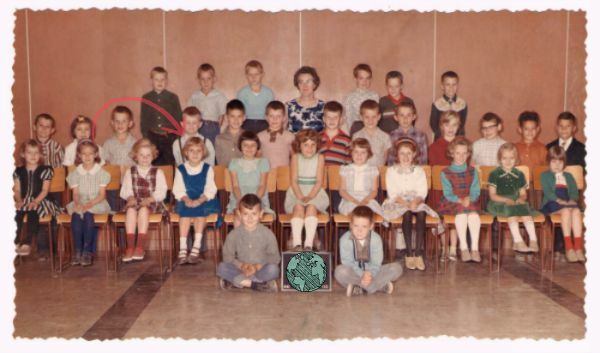 I was in Grade 1 in 1961. So many years ago. Those days were so different to the speed of life today. Where have all those years gone? Like this year. I can't believe we are in September already! Have a lovely week, and thank you so much for stopping by my blog today. Brenda, a delightful story and a fun picture. I remember well those photography days, when we had to all wear something "nice" to school for the picture. I think I have all the grades. Fun to reminisce. I still have similar photos of schooldays! And yes, I do remember those little lunchboxes, before cooked school meals began in England. I don't have a single picture of my grade school classes, or even my individual school pictures. Not ONE! My mother was not a saver - of anything - so I have only my (steadily aging) memories. Oh, but I do remember a boy named Francis, and I thought about him when I saw the boy you liked. Francis wore a shirt quite like that to school one day in first grade. Francis's shirt was red. I happened to wear a red dress on the very same day, and we got teased about being dressed alike. "Francis and Nancy sitting in a tree, k-i-s-s-i-n-g..." Sounded pretty good to me, but I kept such thoughts to myself. I had a crush on Francis for - gosh - maybe a whole week or two. Well, I couldn't HELP it! After all he had that bright red shirt. And d-i-m-p-l-e-s. :) Thanks for great September memories! Thanks for this trip down Memory Lane, Brenda. It also got me going down my own Memory Lane. I spent a lot of years in grade school with teaching and all, so September has lots of beginnings stacked in my treasure chest. This is a good read! Oh sweet story! Your mother's making tuna sandwiches every day had me chuckling. I spent a year making bologna sandwiches for my son one year. Every.single.day. It couldn't have been healthful. You are quite amazing to remember all those school chums. While you do, hope that you make a note. I have already forgotten a number of mine. I must follow my own advice and write down those that I can recall. 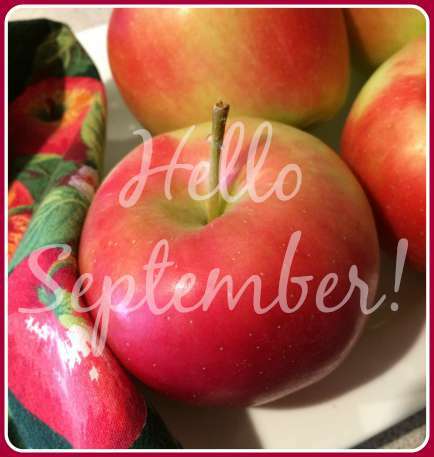 A happy September to you! Now I want an apple! I have enjoyed reading your school reminiscences! Such pleasant memories for you...and for me too. I loved school! My first grade teacher was an angel! Happy September to you, Brenda!! What a lovely trip down memory lane. I've been trying to remember my own lunch. I remember the embroidered napkin my mom made to spread on the desk and the little hand towel, but not the food itself. Funny. And how can it be September already. What a fun post -- yes, I remember the waxed paper, the homemade white bread, the cookies, the apple , , , although for me it was peanut butter and jelly! I had a crush on one of the choir boys and we were looking at each other and giggling one day, and got hauled into the principal's office. He started crying, so that really diminished him in my eyes after that!! I think I was too scared to cry! I'm looking forward to a new crop of apples. They have really been bottom-of-the-barrel for a couple months now. Nothing better than a crunchy fall apple. Lots of memories have been sparked by this post, Brenda. Yes, I remember the lunchboxes - mine was blue with globes on it, I think, or maps. I had a crush on a boy in Grade Three. He had dark curly hair and was so cute. Jimmy was his name. Autumn apples are the BEST!